Turquoise & White, originally uploaded by It's Great To Be Home. Ngoc Minh Ngo, originally uploaded by plastolux. 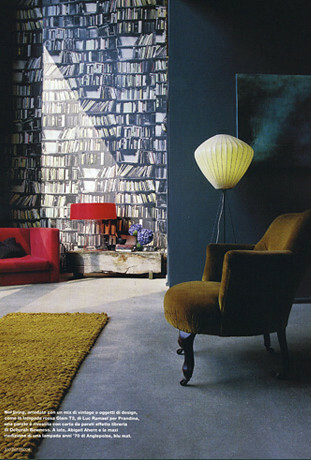 Frank Roop Design + Interiors, originally uploaded by It's Great To Be Home. Monique Lhuillier, originally uploaded by It's Great To Be Home. The Chin Loft, originally uploaded by coco+kelley. toy storage, originally uploaded by lakbdesign/fergusandme. Milu Ltd, originally uploaded by Snook Photograph. red bedroom with black bed sheet. 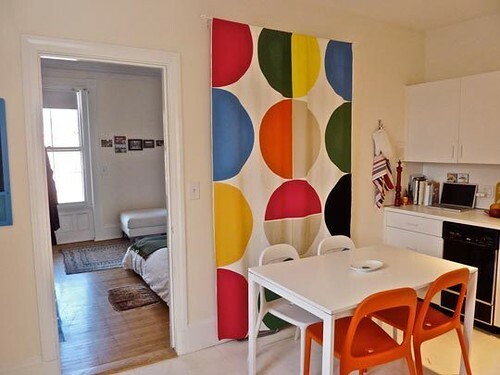 the room is smartly use high contrast color making interesting & modern. Bonesteel Trout Hall, originally uploaded by It's Great To Be Home. untitled, originally uploaded by andrew-tye.com. wooden dining table with comfortable chairs. grey wall with decorated by photo frames. modern-home-office, originally uploaded by baliboro. Roman blind and white cabinet. luxurious wallpaper home-interior, originally uploaded by baliboro. Acid Green Bedroom, originally uploaded by It's Great To Be Home. sasa antic2, originally uploaded by coco+kelley. elle_decor, originally uploaded by StyleMakerTV. bathroom with blue sea feeling. Joyful Paper Silhouettes, originally uploaded by It's Great To Be Home. 1 Find a photograph of a loved one in an active pose. Maybe cousin Mark is running toward the camera, or niece Sarah is jumping on the bed? Or gather friends and stage new shots specifically for this project. The more dynamic the photo, the better. 2 Cut out the figure from the photograph. 3 Trace the figure onto black construction paper and cut it out. 4 Tape the new silhouette onto white paper and insert into frame. 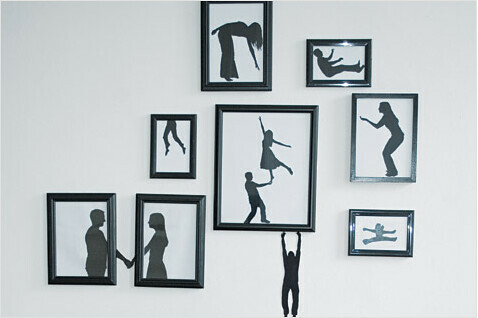 5 Repeat the process and arrange the frames so that each silhouette seemingly interacts with the adjacent figures. Note how Sokoler’s silhouettes appear to be pulling each other from one frame to the next. “I love the idea of keeping the kid alive inside of you,” says recent FIT graduate Katie Sokoler, as she kneels atop a roll of black paper almost twice her size. “All of my projects have a playtime theme, but this one is inspired by the scene in Peter Pan where he tries to sew his shadow back on.” Sokoler, who’s the official photographer for Improv Everywhere, is referring to her college thesis, the Shadow Project, a series of photographs featuring life-size shadows interacting with real people. “I put shadow cutouts on walls all over Brooklyn and waited for people’s feet to match up,” she explains. The Rockland, New York, native spent two weeks (six hours every day) lurking behind cars, waiting for the exact moment that passersby lined up with her art. “It was tough because I wanted the right kind of person—an old man looked better matched with a little boy shadow and a hurried lady looked better with a lighthearted girl cut-out.” Sokoler posted thesis samplings on her blog (colormekatie.blogspot.com) and was soon getting thousands of hits, including visitors from Germany and Turkey. Here, she shows us how to adapt shadows and make playful silhouette art that can be hung in your apartment. 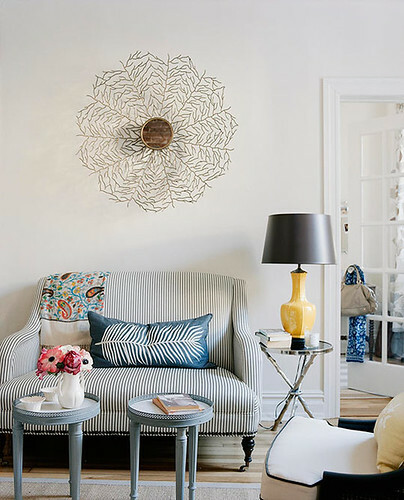 DIY Graphic Wall Hanging, originally uploaded by It's Great To Be Home. I have lived in this sunny one bedroom for about 16 months — it's my home and office (I am an architect) so it needs to function as a place that I can work in during the day and have friends visit over the weekend. It had a lot of nice features to begin with — an eat-in kitchen with a window, hardwood floors, and two working fireplaces — but I have added some color while trying to keep the furniture and general atmosphere simple and uncluttered. I purchased almost all of the furniture from IKEA and my parents are in the oriental carpet business, so I took advantage of that connection and got a few nice carpets! Molly Frey, originally uploaded by It's Great To Be Home. 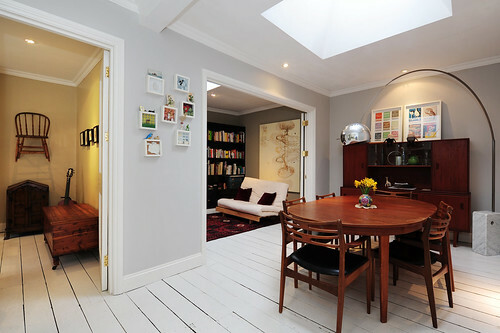 Matte & Glossy Wall Treatment, originally uploaded by It's Great To Be Home. Pale green bedroom with white bed. 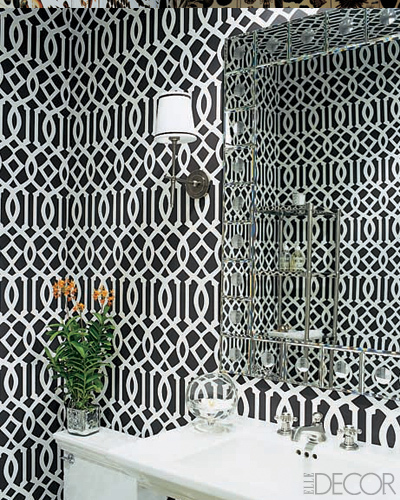 wallpaper, originally uploaded by decorology. lisa congdon's house -- kitchen storage and plate wall, originally uploaded by ooh_food. Suite 22 Interior, originally uploaded by Hindsvik Vintage. white dining room with good stuffs. 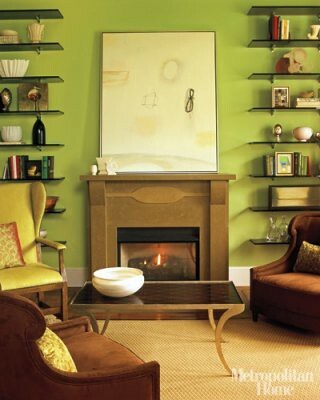 Green living room: 'Sweet Daphne' by Benjamin Moore, originally uploaded by xJavierx. Interior designer Jay Jeffers used a lovely green to update the living room of this 4,000 square-foot Victorian in San Francisco's tony Pacific Heights 'hood. He also added a new fireplace surround by concrete artisan Buddy Rhodes and floating Lucite shelves from Haziza (in a color called Grecian Urn). Two Tuileries chairs from Jacques Garcia's Baker collection and a Gregorius Pineo Dover wing chair (upholstered in Holly Hunt leather) surround a Dessin Fournir Rateau coffee table. Art is by L.A. artist Robert Kingston. Lounge chair fabric is by Malabar; throw pillow fabric is by Place Textiles. Rug is by Treveri, through Sloan Miyasato. Trim is painted Pittsfield Buff by Benjamin Moore. Photo by Grey Crawford, Metropolitan Home, December 2009. It's so sunny out!, originally uploaded by dcfkaf. One might think it's warm out...one would be wrong! It's very sunny but super cold out...but I loved the sun shining in the front door. Ideas for small spaces: Loveseat + pops of yellow + decorative mirror, originally uploaded by xJavierx. Isn't this sweet? It's the wee Brooklyn brownstone apartment of Lauren McGrath (her mother is designer Suzanne McGrath; they blog about design together at the adorable goodbonesgreatpieces.com). They kitted out the living room with an "Odette" loveseat from Mitchell Gold + Bob Williams and Swedish occasional tables, which they found at a consignment store and used in lieu of a hulking coffee table (always a great idea in a small space). 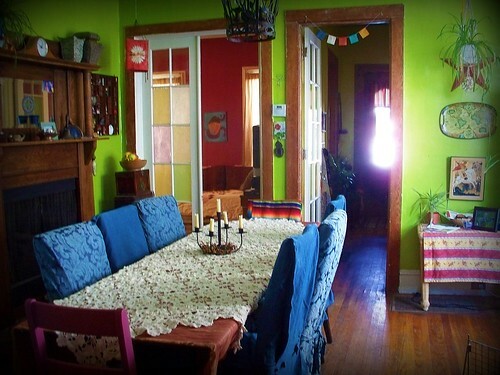 The yellow lamp is a vintage flea market find. No details, unfortunately, on where they scored that feather pillow!